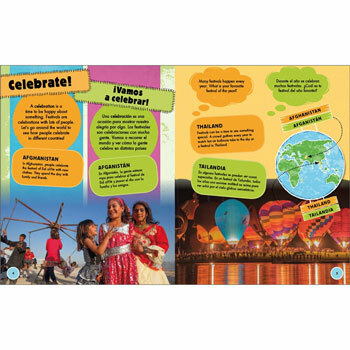 Comparing Countries: Festivals and Celebrations / Compara países: Fiestas y celebraciones is a simple Spanish & English dual Language book that compares and contrasts different ways of life around the world. With the full text in both English and Spanish, take a trip around the world, looking at the many different ways that people celebrate special days, holidays, religious festivals and traditional celebrations. Comparing Countries is a groundbreaking non-fiction dual-language series. Presented in two different languages, each title explores a topic common to all children, from homes to festivals, highlighting what makes us different and what we all have in common. This series provides great support to geography learning, as well as helping young language learners improve their reading skills. 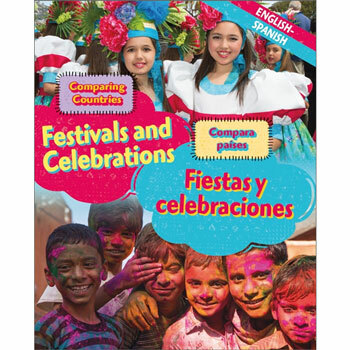 Comparing Countries: Festivals and Celebrations (English & Spanish) would suit either a native Spanish-speaking child learning English as an additional language, or it would be good for young English-speaking children learning Spanish.